Our routine has been established since my little man started nursery sessions every afternoon. When he gets home he’s quite tired but still wants to craft so I’ve started setting up a craft activity ready for when he gets home. Anything using cardboard rolls is generally a success as we have a ready supply of them, so yesterday we did some painting with recycled cardboard flowers. I took some cardboard tubes from my stash and cut them in half. Then I cut them again, about an inch down, to make different petal shapes. The children chose their favourite bottles of paint and we filled paint trays so they could paint the petals. Both children managed really well. The 2 year old just covered everything in paint, including herself. The 4 year old was a little more logical, carefully choosing each colour, and a different brush for each. When each petal was covered they pressed their flowers on to a sheet of paper. They had lots of messy fun although we all agreed that the recycled cardboard flowers looked prettier covered in paint than the painted paper! This is my entry to the Center Parcs and Tots 100 March challenge. If I’m chosen, I would like to visit Longleat Forest, Warminster, Wiltshire. Their Creative Crafter, Emma Hull shared her top tips and one of them was ‘find materials around the house to add to the painting’. This inspired us to raid our recycling box and paint with things we already had. Cool, lovely idea for a rainy afternoon! 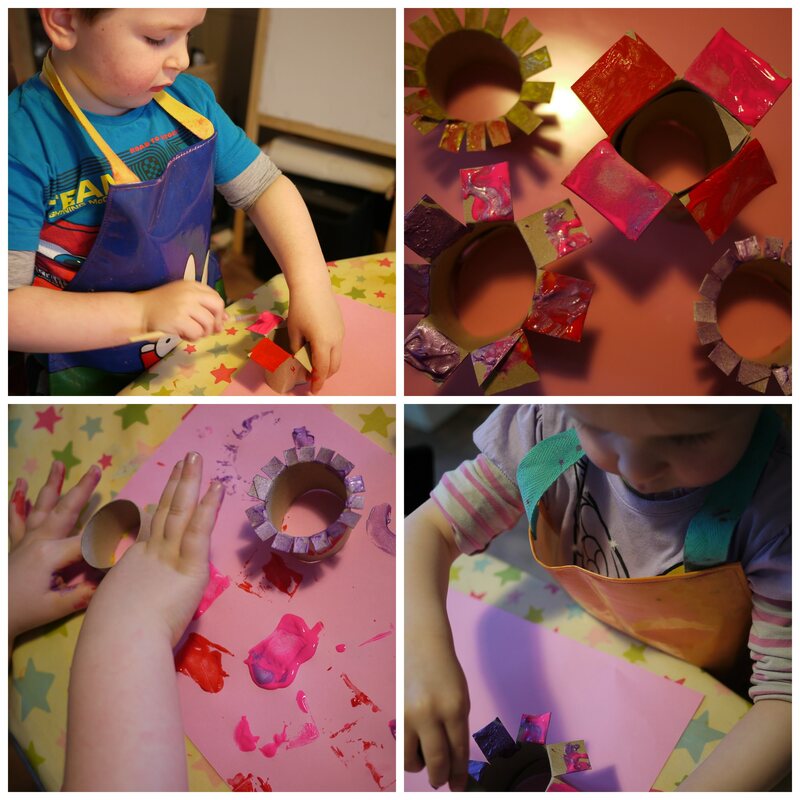 What a lovely idea – perfect craft activity for little ones. What a great idea! My 3 would love this…a chance to get the paint out and splash it around a bit! Thank you for sharing! Good luck with the challenge. I do wish my son would do some crafting as it looks like so much fun. This is a favourite activity of ours, some great stamping effects can be created with a loo roll! Wow, you’re amazing setting up a different craft activity every afternoon! This one looks like lots of fun. You can’t go wrong with a bit of crafting can you?! I don’t think I’ve met a child yet doesn’t love getting messy with glue and paint and being all creative! Lovely craft! Good luck for your entry! 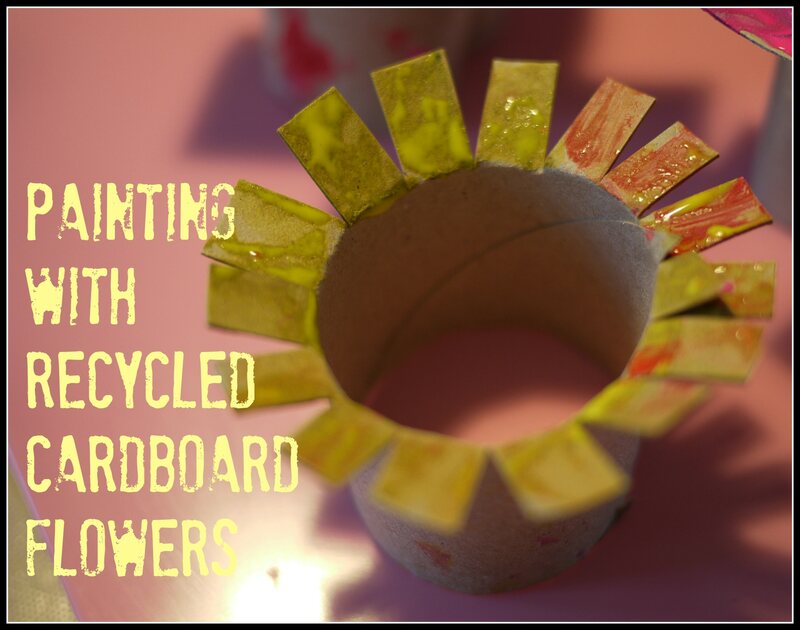 I love recycling cardboard – flowers are such a good and clever idea.